화엄사 각황전 앞에 세워진 이 석등은 전체 높이 6.4m로 한국에서 가장 커다란 규모이다. 석등은 부처의 광명을 상징한다 하여 광명등(光明燈)이라고도 하는데, 대개 사찰의 대웅전이나 탑과 같은 중요한 건축물 앞에 배치된다. 불을 밝혀두는 화사석(火舍石)을 중심으로, 아래로는 3단의 받침돌을 두고, 위로는 지붕돌을 올린 후 꼭대기에 머리장식을 얹어 마무리한다. 8각 바닥돌 위의 아래받침돌에는 엎어놓은 연꽃무늬를 큼직하게 조각해 놓았고, 그 위로는 장고 모양의 가운데 기둥을 세워두었다. 장고 모양의 특이한 기둥형태는 통일신라시대 후기에 유행했던 것으로, 이 석등은 그 중에서도 가장 전형적인 형태를 보이고 있다. 기둥 위로는 솟은 연꽃무늬를 조각한 윗받침돌을 두어 화사석을 받치도록 하였다. 8각으로 이루어진 화사석은 불빛이 퍼져나오도록 4개의 창을 뚫어 놓았다. 큼직한 귀꽃이 눈에 띄는 8각의 지붕돌 위로는 머리 장식이 온전하게 남아있어 전체적인 완성미를 더해준다. 이 석등은 통일신라 헌안왕 4년(860)에서 경문왕 13년(873) 사이에 세워졌을 것으로 추정되며, 석등 뒤에 세워진 각황전의 위용과 좋은 조화를 보여준다. 약간의 둔중한 감이 느껴지긴 하지만 활짝 핀 연꽃조각의 소박미와 화사석·지붕돌 등에서 보여주는 웅건한 조각미를 간직한 통일신라시대의 대표적 작품이다. 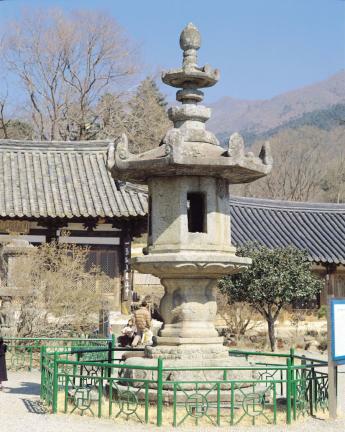 Stone lanterns generally represent the light of Buddha, and are usually placed in front of important structures such as a main prayer hall or a pagoda. 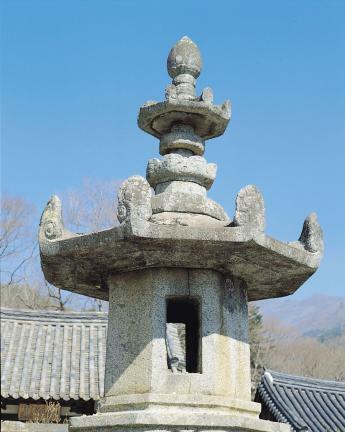 Stone lanterns consist of a niche in which a candle is placed, a post, stone supports, and a roofstone with a head decoration on the top. 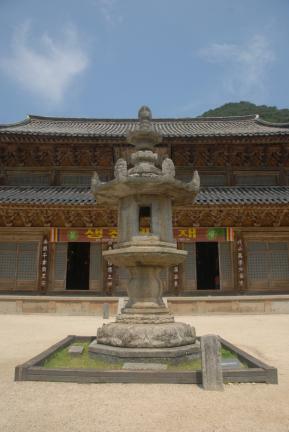 The stone lantern of Gakhwangjeon Hall of Hwaeomsa Temple is 6.4m high, making it the largest stone lantern in Korea. On the octagonal platform stands a unique lantern post shaped like an hourglass. 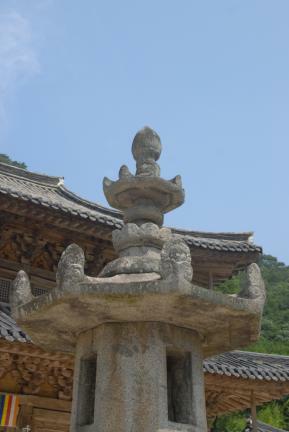 This unique form was popular during the late Unified Silla Period. 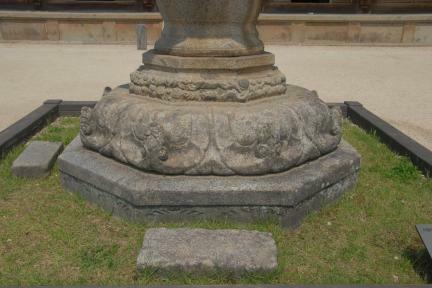 The upside-down shape of a large lotus flower is carved on the octagonal platform, and an hourglass-shaped post stands on the carving. In addition, a full-bloomed lotus flower is carved on the support stone on which the octagonal lantern niche with four openings rests. The large corner flower standing straight on the octagonal roofstone is outstanding. Since the head decoration remains as it was on the roofstone, the beauty becomes closer to perfection. 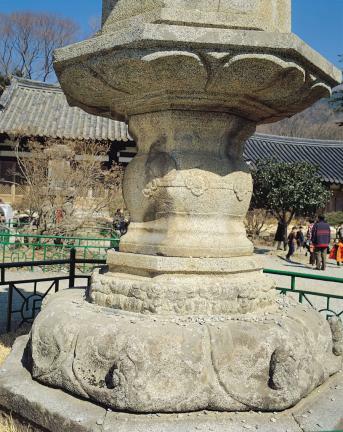 This stone lantern is presumed to have been built sometime between 860 (the 4th year of King Heonan’s reign) and 873 (the 13th year of King Gyeongmun’s reign). 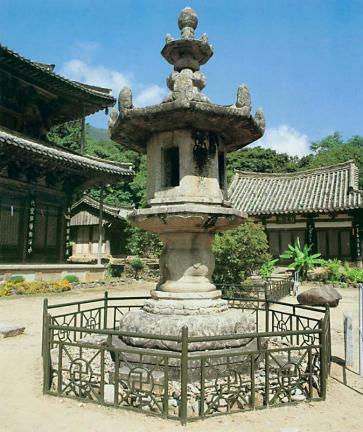 The chief characteristic of this stone lantern is the hourglass-shaped center flower stone. 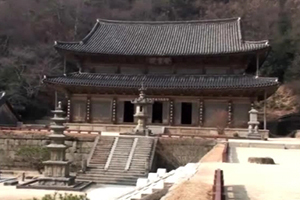 The lantern forms a pleasant contrast with the dignified appearance of Gakhwangjeon Hall at the rear. Though it feels a little heavy, it exhibits the simple beauty of lotus flowers in full bloom and the grand beauty of the niche and roofstone, and as such is considered a representative work of the Unified Silla Period.